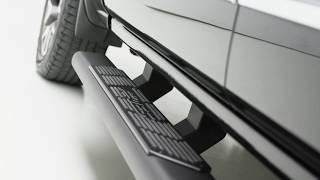 With their elegant profile, fully blended ends, and unique steel-over-polyethylene step pads, the all-new AscentStep running boards from ARIES give your pride and joy the uncompromising and stylish accent it deserves. The unique teardrop design, with its subtle curves and tapering board, really stands above more common tubular steps. ARIES AscentStep boards are made from high-strength steel and fortified with a combination E-coated and carbide black powder-coated finish for superior resistance to the elements. 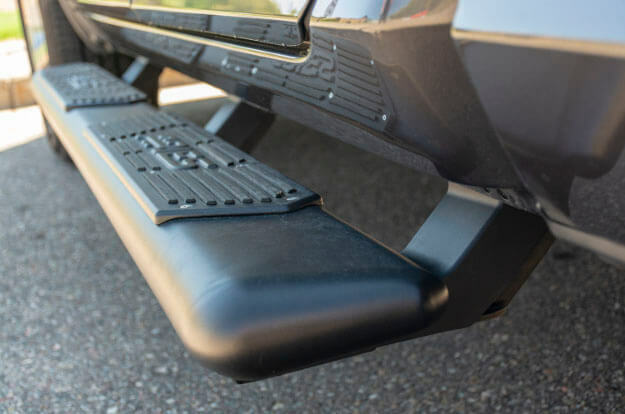 Using ARIES’ innovative and vehicle-specific VersaTrac mounting system, the AscentStep goes on with no drilling and no fuss. Elegant, teardrop shape and seamless, blended end caps. Powder-coated and E-coated carbon steel construction. Polyethylene step tread overlaid by a stainless steel plate for enhanced traction and resistance to foot traffic. VersaTrac mounting system with vehicle-specific brackets and bracket covers—no drilling required. To find your nearest Performance Corner® affiliate, see our Store Locator. Or join the conversation at the Performance Corner® Facebook page.